Flowers and fist bumps: Who thinks Theresa May has done well on the Salisbury attack? One of the most incredible things about the response to the Salisbury nerve agent attack is that as the result of an absolute barrage of reality-reversing propaganda from the mainstream media (including the BBC) millions have been duped into believing that Theresa May has actually done a good job of responding to it. In this article I'm going to go through just a few of the things that demonstrate what an appalling job she's actually done. The Tories have taken an astounding £3 million in donations from Russian oligarchs and Putin cronies since 2010, including £800,000+ since Theresa May became Prime Minister. In the wake of this chemical weapons attack on British soil they've steadfastly refused to return a penny of it. Just imagine the purely hypothetical situation that Iran had conducted a chemical weapons attack on British soil, and that the Labour Party coffers were stuffed with £3 million in Iranian cash, and that Jeremy Corbyn was refusing to pay back a penny of it or explain what kind of influence all that cash had bought. Do you honestly think the mainstream media wouldn't be making any fuss over it, and that public opinion of Corbyn's handling of the situation would be favourable? Theresa May appointed the staggeringly underqualified former fireplace salesman Gavin Williamson as Defence Secretary in her shambolic January 2018 reshuffle. For his first two months in the job he did virtually nothing except allow the Tory party to sell personal access to him for £30,000 to the wife of a former Putin finance minister. What Williamson and this Putin stooge discussed has not been made public. Just two weeks before the Salisbury attack the Tory government brazenly obstructed Labour's efforts to introduce Magnitsky powers to clamp down on the flood of Russian dark money flowing into the City of London and the UK housing market. An Opinium poll found that 65% of British people are in favour of Magnitsky powes as opposed to just 5% against, but thanks to the complicity of the mainstream media, neither Theresa May nor other senior Tory ministers have been grilled over why they brazenly obstructed these Magnitsky powers just a couple of weeks ago. Theresa May eventually caved in to Jeremy Corbyn's pressure and announced that the Tories would be seeking to introduce Magnitsky powers like he has been arguining in favour of for eight years, however the mainstream press decided not to portray this as the screeching Tory U-turn that it so clearly is. How can a political party go from crudely and brazenly obstructing efforts to introduce Magnitsky powers two weeks ago, to suddenly supporting them, without anyone in the mainstream media clocking it as a massive U-turn? For the best part of a week the Tories and their chums in the mainstream press derided Jeremy Corbyn for daring to ask questions about the proof that Russians were behind the attack. Then it turned out that Theresa May had actually hidden intelligence about the attack from Corbyn. Cutting Corbyn out of the intelligence loop then deriding him for asking questions is about as cynical a ploy as can be imagined, especially when the subject under debate is an unprecedented chemical weapons attack on British soil. Mainstream media hacks were quick to accuse Corbyn of "politicising the attack" when he asked pertinent questions about the flood of Russian cash into Tory party coffers and their continual obstruction of Magnitsky powers. But then they "forgot" to make similarly outraged (and much more justified) accusations that Theresa May and the Tories had been "politicising the attack" by hiding vital information from Corbyn, then caricaturing him as some kind of Russian stooge for ... erm ... asking for more information! After deriding Corbyn's calm evidence-seeking approach to the attack for the best part of a week, the Tories and the mainstream press turned a blind eye to Gavin Williamson's incredible sub-juvenile whine that "Russia should go away and shut up". If Theresa May had any authority whatever over her shambles of a party she would have slapped Williamson down for demeaning his office like that, issued an official retraction and a clear reiteration of Britain's actual position, and then told the catastrophically unfit Williamson to submit his resignation. She didn't do any of that because he's one of her last remaining allies within the party, meaning she'd rather have Britain made a laughing stock on the world stage than weaken her own position within the Tory party. Gavin Williamson is not the only Tory minister to have made a complete pillock of himself and been allowed to get away with it Scott free. Aside from all of his bumbling rhetoric, Boris Johnson has tied himself in an impossible knot by claiming that Russia has been building up a stockpile of chemical weapons, which is in stark contrast to the findings of the Organisation for Prevention of Chemical Weapons (OPCW) who oversaw and certified Russia's destruction of their chemical weapons programme, then describing the OPCW are "reliable" "technical experts". Now they're either reliable technical experts or they're a bunch of bumbling idiots who certified Russia's destruction of their chemical weapons while Russia was busy expanding their chemical weapons programme. They simply can't be both. This kind of bumbling and self-contradictory "making it up as he goes along" rubbish is an absolute embarrassment to Britain, but Theresa May can't sack him, or even publicly disagree with him, because she knows that the secretive cabal of ERG Brextremists who control her every move would have here out of Downing Street in a flash if she even tried it. 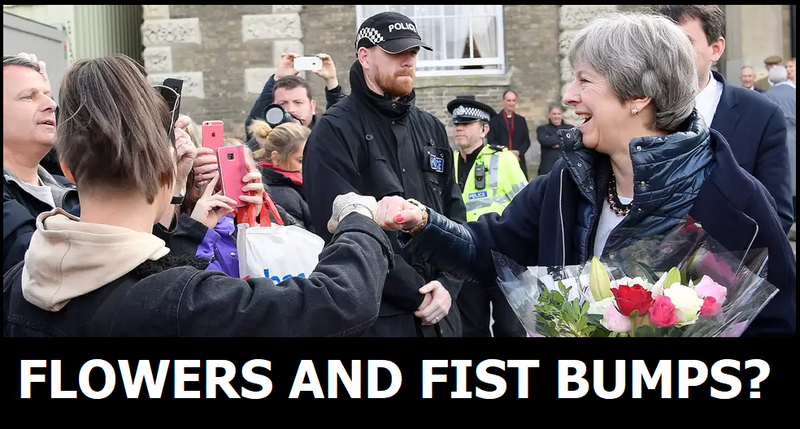 Theresa May's visit to Salisbury was an utterly bizarre spectacle. 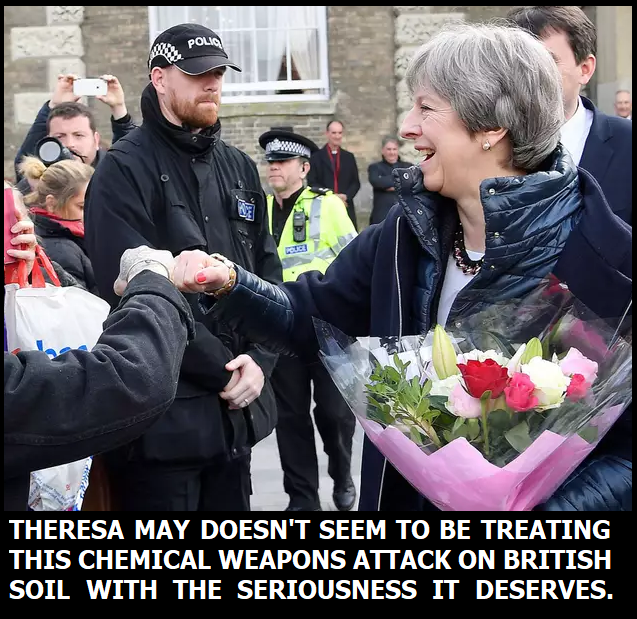 She was visiting the site of an unprecedented chemical weapons attack on British soil, with three people gravely ill in hospital, and she treated it like she was some C list actor delighted that they've been invited to a glamorous film premiere, when they know they didn;t do anything to deserve it. Fist bumps here, selfies there, and a truly cringeworthy photo op with a baby thrown in too. At a time of national crisis do we want a leader who takes the situation seriously and is seen to have concern for the victims and their families, or do we want one who cavorts around the crime scene like a C-list celebrity? I guess regular Another Angry Voice readers will at least be familiar with some of this damning evidence, but millions clearly aren't. Millions of people remain confined within carefully curated mainstream media echo chambers. 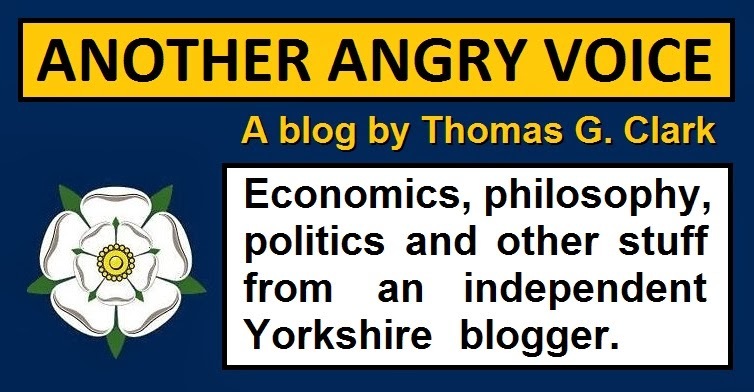 They get their politics from the right-wing propaganda rags, from the BBC, and maybe from the commercial radio news items on the workplace radio. And that's it. In order to unmask the mainstream media's reality-reversed propaganda deceptions it's no good just talking amongst ourselves, we need to get the real information out there to people who wouldn't otherwise see it. Feel free to print this article off, email it, or share it in whatever way you see fit.